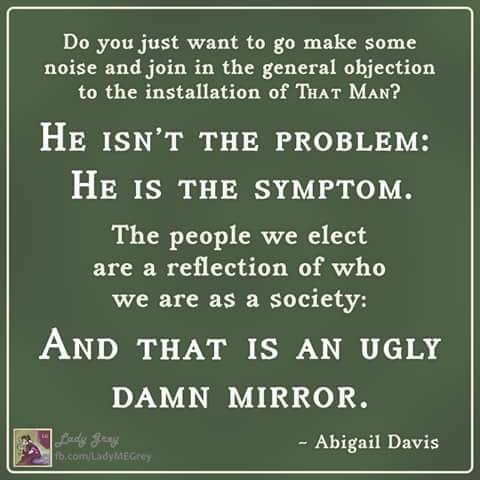 This entry was posted in News & Views, Quotes and tagged Abigail Davis, election, mirror, noise, objection, problem, reality, reflection, society, symptom, ugly on March 27, 2018 by Ray Buchanan. I am currently dealing with a number of good people who are angry. Much of that anger is being expressed at me, but I understand why they are angry and what is motivating their anger. The source of their anger and the pain that is causing it is far deeper than me or my words and actions. Dealing with ugly realities is never easy, and it is especially difficult in a society where we have always desired not dealing with anything ugly, messy or painful. 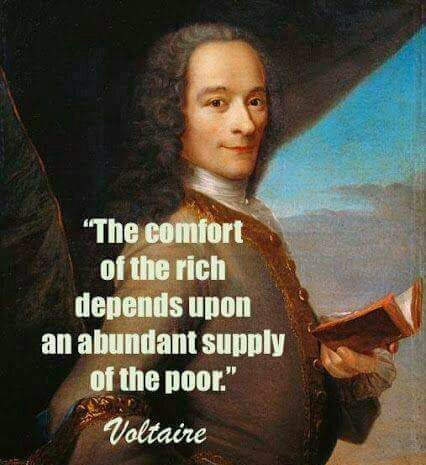 An example is this quote by Voltaire. It is an ugly truth that will immediately make many reading it upset and angry. That, however,m doesn’t change the truthfulness of the quote. It’s o.k. to get angry at ugly truth and painful facts. But, if we analyze the reason for our anger we have the opportunity to grow from it. We can then work to either accept or change the ugly truth which makes us angry. Or, as in the case with some of those who are now directing their anger toward me, we can ignore the truth until it becomes an infection of anger and bitterness causing us to lash out in pain. The only problem with the latter approach is that the source of the infection, that ugly truth still needs to be dealt with, doesn’t it? This entry was posted in Hunger & Poverty, News & Views, Quotes and tagged anger, bitterness, choice, comfort, history, infection, insight, pain, poor, poverty, quotes, rich, supply, truth, ugly, Voltaire, wealth on March 19, 2017 by Ray Buchanan.